AGLT2 hosts one of the 3 ATLAS muon calibration centers, along with Rome and Munich, which calibrate the Monitored Drift Tubes (MDTs) of the ATLAS muon spectrometer. Calibrations are performed daily with high-statistics data sent from the level-2 trigger of ATLAS, and new calibrations constants are uploaded to the ATLAS conditions database. What is a Monitored Drift Tube? The ATLAS muon spectrometer measures muon momentum by measuring the "sagitta" or bending of muons in the large magnetic fields generated by the ATLAS toroidal magnets. MDTs are hollow gas-filled tubes with a wire down the center as illustrated in this diagram. Muons passing through the gas excite electrons and we can determine the distance from the central wire by timing how long it takes those electrons to arrive at the wire. Monitored Drift Tubes are arranged in many layers which allows tracking the muons through the magnetic field. Muons are fundamental, point like particles similar to electrons, but 200x more massive and unstable (lifetime ~ 2 microsecond), and are electrically charged. 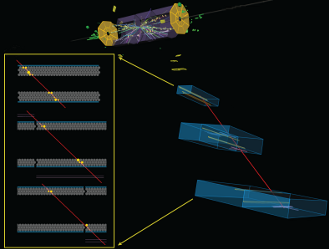 Muons are produced copiously in the the proton-proton collisions at the LHC, and most pass completely through the ATLAS detector before decaying. 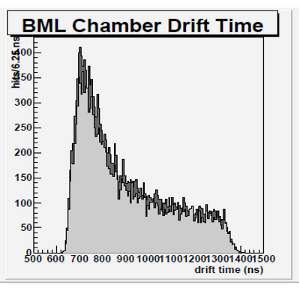 Muons emerge from the decay of new particles produced in the LHC and therefore we want to measure muon properties such as momentum using the ATLAS muon spectrometer. Why are we calibrating MDTs? A variety of factors effect the timing of signals from the MDTs. The timing between when a particle passes through the tube and when we read a signal can be altered by the properties of the filler gas, gradual wire-sag in the tubes, magnetic fields, and gravitational effects from the orbit of the moon. Therefore we must regularly measure the response from the MDTs versus a known baseline. The timing between passage of a particle and measurement of a signal on the wire. 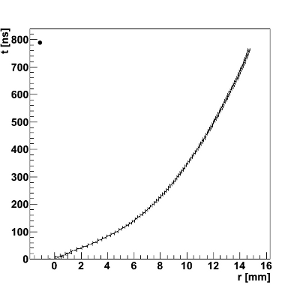 Function used to determine the distance of the particle from the inner wire over the time it passes through the tube. Measurement of number of electron hits on inner wire from first signal to last. UM physicists have staged a dedicated monitor drift chamber near the ATLAS detector which samples from the 2 million liters of gas fed to and exhausted from the muon spectrometer daily. This monitor determines a drift time and records variations caused by changes in chemical properties such as the fraction of the each component gas, amount of water vapor, etc. 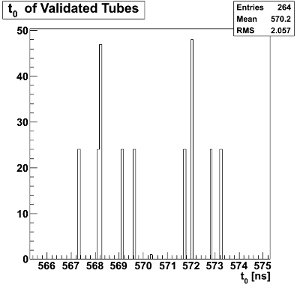 The drift tube calibration is very sensitive to the gas composition. The hourly measurement is used to inform the calibration program of observed changes. The typical average daily sensitivity is a few parts per million change in gas composition. 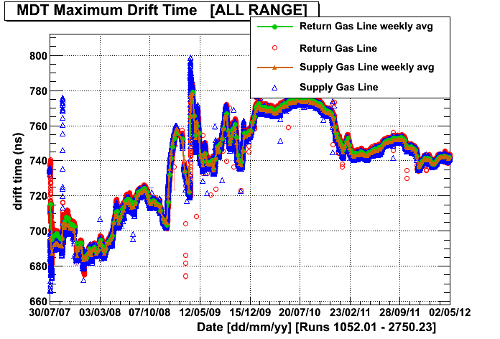 The accompanying plot shows the MDT maximum drift time measurement for the past five years.